Welcome to The Fourth Wall, CHIRP's weekly e-conversation on cinema. 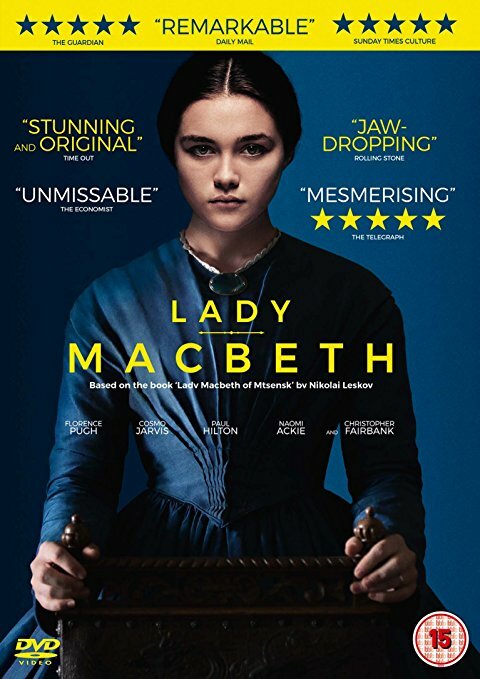 This week's subject is the independent film Lady MacBeth. Kevin, from the moment I finished watching Lady MacBeth until now I’ve been thinking deep thoughts. This movie is not my favorite – in fact it might be my least favorite film of the last five years or so. But it did get me thinking that, if I didn’t like this movie (and I definitely didn’t), then why I do like other stories like it? In this movie, Florence Pugh plays Katherine, a young sociopath who lives on a huge country estate with her husband Alexander and father-in-law, each man not so much a character as a walking list of unpleasant tics. Katherine’s not getting enough affection from her husband, so she takes up with a stable hand (Cosmo Jarvis). When the intrigue of the situation escalates, she starts killing people, much to the chagrin of her black maid and only constant companion Anna (Naomi Ackie). That’s pretty much the plot of the movie. It features several basic production shortcomings, starting with the lack of a simple time and place title card to let the audience know when and where this story is taking place. Director William Oldroyd and cinematographer Ari Wegner chose to compose the movies using a series of long, quiet, still frames which only result in several unearned jump scares and the movie itself feeling a lot longer than its 90-minute run time. If you’re going to use a technique perfected by Kubrick in Barry Lyndon, you better have more to offer than dead silence and empty rooms. Also, the overall plot hinges on the resurrection of a particularly ugly film stereotype of the mute black servant whose main role is to be scared of their white master. This isn’t so much an unpleasant “misunderstanding” as a case of a bad filmmaking decision. There are a lot of unanswered questions about Katherine, but very little is left to the imagination about what she is. She is a victim of abuse, but she’s also anti-social, reckless, and not so much “fierce” as “vicious” in how she deals with her problems and other people. Audience members walking into the theater thinking they’re going to be watching a feminist revisionist fantasy about Victorian-era womanhood will probably change their minds once a child becomes involved with the main character’s wrath. My dilemma as a critic in regards to this movie lies in the fact that for the past several weeks I’ve been catch-up binge-watching Game of Thrones, the HBO mega-hit fantasy series that features an average of at least 2-3 killings (including major characters) every episode. I’ve just started season 5, and I can say without a doubt that I’ve seen more murders in more ways and for more reasons than at any period in my media-watching life. And yet, I’m not nearly as turned-off by the mayhem in the sprawling GoTepic as I am by this one 90-minute story. I'm still considering why, though. So, Kevin, what did you think of this movie? You know, my first thought upon viewing Lady Macbeth was that it was one of the better films I've seen this year! Florence Pugh* carries the film with great aplomb, and my hunch is that she'll be a star down the line. 1) I think "not getting enough attention from her husband" is putting the problem pretty mildly! Katherine, who seems like quite an intelligent and independent young woman, is cruelly reduced to being a prisoner in her own home. Along with a daily ordeal of being s-q-u-e-e-z-e-d into painful corsets, she essentially has nothing to do but sit around and stare blankly into space. It's also clear that she is to be seen and not heard; she's essentially another piece of furniture who in fact was "purchased" along with a plot of land. 2) Once Katherine's husband and father-in-law leave for business and she gets a taste of freedom (not to mention a sexual liaison with one of the hired hands), she refuses to go back to her old life when they return. I agree in that there's definitely a Moral Event Horizon that is crossed -- or stampeded over, probably -- late in this film. But until then? I would've thought that most viewers would feel mighty sympathetic towards her? And I think that makes the film more interesting. It's not just a revenge story, and we're left in the uncomfortable position of having to radically reassess our opinion of her character after rooting for her during the previous hour. 3) The cinematography worked for me? I thought the long, quiet scenes really impressed upon me the excruciating boredom that was Katherine's married life. And isn't it a bit uncommon for films to get title/year place cards? Kubrick's Barry Lyndon got one, but my sense is that they're generally omitted more than not. 4) The issue of race in the film is a tricky matter, to be sure. Katherine's hapless personal maid Anna was black, but so was Agnes (Golda Rosheuvel), who escorts the out-of-wedlock son of Katherine's husband to the estate. Agnes is clearly a woman of some means and no one's servant. And I guess I had the impression that all the servants, both white and black, were a bit fearful of their employers? Though Anna certainly received the brunt of the punishment. You mentioned that you enjoyed films *like* Lady Macbeth, even if this particular one rubbed you the wrong way. Was that in terms of style, period, or both? What were some of the others? I haven't seen many films set in the Victorian era, and even if we were to stretch that time period back a century or so, only Lyndon and Dangerous Liasions (both of which I enjoyed immensely) come to mind. You’re spot-on about Florence Pugh’s similarity to Maisie Williams. When I was watching the movie I kept asking myself “Where have I seen her before?” Thanks for making that connection! I thought Pugh did a good job with the material she was given, which to me wasn’t much. I felt only somewhat sympathetic toward Katherine in the sense that she’s a woman living in what appears to be ye-olde-tyme England and therefore subject to the same prejudices and abuse of any woman. Beyond that, she initially came across as such a blank slate that I had no idea what to make of her. Where’s she from? Does she have a history of violence? Did whoever she was living with before marry her off because they couldn’t stand to live with her anymore? More questions: what business is Katherine’s husband conducting that requires him to be away for so long? Why are he and his father so mean? What is the purpose of this huge estate in the middle of nowhere that seems to employ only a couple of maids and a few farmhands? I think this overall lack of dialogue and context works to the film’s disadvantage. The entire production is very sparse, which I understand as a practical matter since the movie was made for only half a million pounds, a tiny budget even by indie film standards. Even factoring that in, though, I feel there’s a lot missing, both physically and in the narrative being presented. Usually there’s some way to tell the audience, their explicitly or through dialogue, that the story is happening at a particular time in a particular place. I read that the book this movie is adapted from is based in 1865. A five-second “England, 1865” visual at the top would have gone a long way in setting up the story. And I still can’t get a satisfactory grasp on this movie's racial element. I didn’t get the sense that any of the other servants were reacting to Katherine’s actions with the same amount of distress as Anna or Katherine’s lover, who I’m pretty sure is biracial. I feel like there’s a reason those particular characters were cast by black actors, but I don’t know what it is. Do you have any theories as to what, if anything, was happening there? I see this movie as existing in two broad categories. As far as the generalized time period, movies like Amadeus, A Man for All Seasons, and The Lion in Winter come to mind, although the timeline is off by a century or so. So many casts in movies that are not “modern-day” speak with English accents, I might be confusing some in my mind! As far as the theme “maniacs doing horrible things to innocent people,” I’m reminded of movies like Natural Born Killers, Seven, and A Clockwork Orange. In those cases, it’s clear that the stories are satirical or dystopian in some way. I feel there’s not enough information in Lady MacBeth to say the same about that film. In sum, that might be the overall sticking point for me in regards to this film. What is it trying to say? [*melodramatically gesturing to the heavens*] WHAT DOES IT ALL MEAN??? I agree in that there wasn't a terrible amount of exposition, but what little there existed worked for me? We see a smirk of playful mischief from Katherine during the wedding in the opening scene, and then soon afterwards she mentions that she loves being outside -- upon which it is made quite clear that she won't be allowed to leave the house. Was there ever even a single word of kindness directed towards her from her husband or father-in-law? The two were hardly seen without perpetual scowls on their faces. Katherine seemed to also be interested in her new family's affairs (which I thought revolved around coal, though I'm not certain), but any queries from her to that end were also shot down. My take was that she was a curious, independent woman? Whereas someone who was a dullard would have been more than content to sit in her corset and immerse herself in embroidery. As for Katherine's lover (Sebastian), I agree in that him being biracial definitely seemed to be a purposeful wrinkle? I'm not entirely sure to what end, except perhaps to counterbalance any issues of race & class represented by the maid, Anna? (And as it turns out, he had much more of a conscience than Katherine... for which he was brutally punished.) On a related tangent, I was a bit horrified that apparently the groundskeepers slept in hovel-like stables -- not even small rooms and beds for these poor folks? As far as "What It All Means" (ha! ), perhaps the #1 lesson should be to treat spouses with respect? And that if you ignore #1, then at the very least employ a food-tester! In all seriousness, I think the film does pose some interesting questions as far as the level of "revenge" that's acceptable on the behalf of the maligned. Most of us are rooting for Katherine to be free of her unfortunate predicament... but what are we willing to morally sanction in pursuit of such an end? Let's say that Agnes and her grandson never show up at the estate to press their claim for financial support via his status as the son of Katherine's late husband. Thus, the young lad never meets a violent end, and Sebastian (who was already starting to get used to hot meals and clean clothes) ends the film as the lord of the castle. How do we feel then? What do we make of Katherine's moral compass? And what would we have done were we in her shoes? Share August 11, 2017 • http://chrp.at/1qjX • Share on Facebook • Tweet This!